Mats Zuccarello might be the most tenacious player in the NHL, though he hardly looks the part. His curly, shoulder-length hair and disarming half-grin suggest that the winger is a laid-back type -- rather than the hard-nosed heart of theNew York Rangers. Then there's his physical stature. At 5-foot-8 (he was listed at 5-foot-7 his first few years in the league) and 179 pounds, Zuccarello swims in his uniform like it's an oversized pair of basketball shorts and his dad's old sweater. 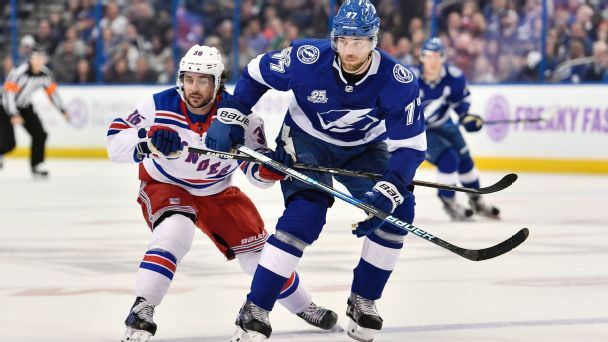 That is especially apparent when he's tussling with a towering defenseman such as the Tampa Bay Lightning's Victor Hedman, which he did earlier this month, even goading the 6-foot-6 Hedman into some after-the-whistle shoving. Consider also what Zuccarello has overcome since he arrived on Broadway: During Game 5 of the 2015 Eastern Conference quarterfinals, a slap shot off the stick of teammateRyan McDonaghcareened into Zuccarello's helmet. The winger was rushed to the hospital, where he was diagnosed with a fractured skull and brain contusion. He remained hospitalized for three days, lost feeling in his left arm and couldn't speak for four days. "I still have effects from it," Zuccarello said. "My talking is a little bit off when I get tired or I talk fast. I kind of stumble on words. Some words are harder than others. It is what it is. I'm from Norway anyway, so they don't expect me to speak perfect English." Zuccarello is now an alternate captain for the Rangers and the team's leading point scorer in three of the past four seasons. Croons of "Zuuuuuuuc" swell through Madison Square Garden any time the 30-year-old as much as poke-checks. Zuccarello's path might be unique, but he's emblematic of a larger trend in hockey -- or, rather, a smaller one. As athletes across other sports grow -- NBA players uniformly measure taller, and NFL players are consistently stronger -- the NHL has become faster and shorter. This season, there are 37 players in the NHL shorter than 5-foot-9. Twenty years ago, there were only 20. As a service to anyone who has been told he is too small to make it, ESPN asked Zuccarello to share some of his secrets. Here is his guide to surviving in the NHL as an undersized winger. When Zuccarello debuted for the Rangers in 2010, he used a comically large stick. It was taller than he was. "Have you seen how long his stick is?" defenseman Brady Skjeisaid, laughing. "I have no idea how he's able to stick-handle with that thing. It's remarkable." The advantage: It augments Zuccarello's radius and gives him artificial reach. "I always played with a long stick -- I've had it since I was a kid -- so it's something I'm used to by now," Zuccarello said. "I like to change up my stick. I don't remember what length it was [then]. It's probably a little bit shorter now than when I came into the league, but I like it this way." Zuccarello is a swift skater but not the fastest guy out there. Say he enters the zone and sees a Zdeno Chara (6-foot-9) or Hedman staring him down. What does he do? "Obviously, you can outmuscle guys, but to beat a big tough is going to be tough," he said. "So you need to be a little bit smarter, you know. You need to avoid the areas where you would go toe to toe with a really big guy and try to be quick and spin off of those guys. I probably try not [to] go toe to toe with those guys. I try to stay a little bit on the outside and try to outsmart them. It's hard to get me. " Sometimes an obstacle -- even one in the form of a towering defenseman -- is an opportunity. "I try to use my size to my advantage -- spin off of hits," Zuccarello said. "A disadvantage obviously is this: You have some big guys in front of the net, you have to fight for position. Vision is not really a problem. If there is a guy in front of me, I'll just look underneath him." Zuccarello might be the shortest skater on the Rangers -- and most every other team he has been on -- but he plays with a giant-sized passion. "I got a little bit older, and I got a little bit stronger. I came up in Norway, and everyone thought I was too small to play with adults. When I got to Sweden, everyone thought I was too small to play there, and then the same thing here." Every player says his dream has always been to suit up for the NHL. But not Zuccarello. "I kind of reached my goal when I played in Sweden," he said. "That was my dream. I never thought I would be able to play here. I guess it was always a dream in the back [of my mind], but it was never something that I thought about or hoped to do. It was more like a thing that's so far away." His first inkling that he was good enough to compete in the world's top league came when he excelled for Norway in the 2010 Olympic Games. "When I first heard about [NHL teams having interest in me], it was a really big deal for me," he said. "After the Olympics in Vancouver, that was the first time I heard about it. And I just thought, 'That's pretty cool.' So that was my new dream, my new goal." When Zuccarello first made the New York roster, it was essentially as a shootout specialist. Then-coach John Tortorella loved using Zuccarello in the skills competition, even if he didn't yet trust him with hefty game minutes. "I don't know if it was something I worked that much on or wanted to be only known for," Zuccarello said. "I did spend a lot of hours [growing up] on the pond trying new skills. If I score a goal, and it helps my team win, I love it." Hockey isn't a big deal in Norway, so as a kid, Zuccarello played plenty of other sports. He credits that with helping him become well-rounded. "To stay in shape during the summer, I like to do other sports," he said. "I play soccer, and I also like to do fun stuff, like floorball or something that you can have fun with." But he draws the line at distance running. "Running 10 miles? That's not fun for me," he said. "Some people run or do the bike, but I don't like that. We do inside hockey with a ball, play soccer inside or outside, stuff like that. That's how I grew up working out, so that's how I do it now." Zuccarello hears from plenty of other people -- including kids -- who have been told they're too small to go far in sports. His advice is borne of his own experience. "It's got to be fuel when people tell you you can't do anything or you can't make it," he said. "So work hard. Try to work harder than the bigger guys. And be patient. If you're 12 or 13 or 14 ... people grow differently. Someone else might grow big and strong, and sometimes you'll feel like you can't do what you want to do. But keep working hard. It's going to even out in the end. And have fun. That's my biggest thing: Always have fun."